Although Christmas is already over, there still are a lot of clementines or tangerines to buy in the markets, which is why it is time to say a few words about this excellent drink before you have to wait again for the next clementines-season. 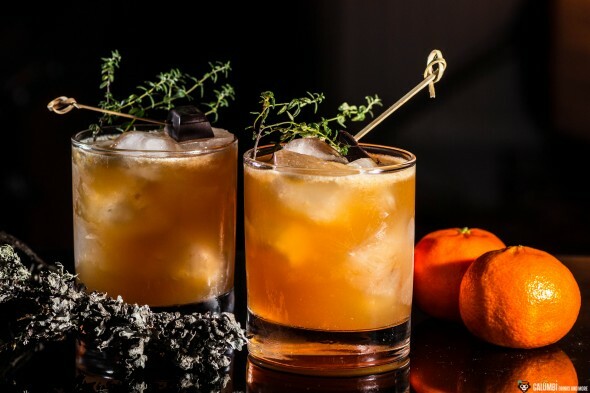 The Chocosnaps med Clementin is a drink I once again got to know through the Mixology magazine. It is an invention of Copenhagens barchef Hardeep Singh Rehal of bar “1105” and it’s very popular in the Danish capital during the winter months. My curiosity was aroused mainly by the use of clementines, because these citrus fruits are rather rarely seen in a cocktail. The preparation takes some planning, but do not worry – it’s worth it! The combination of clementines and chocolate and thyme infused Aquavit is an excellent one. You can scent a Christmassy smell coming from the glass and you’ll feel the immediate desire to try a sip. The drink tastes absolutely fantastic: At first there are chocolate notes accompanied by a very fine thyme touch while the impression immediately shifts over to the richness of the Clementines. The lemon juice balances the sweetness of the drink and gives it a fresh twist. In the finish you can taste the caraway of the aquavit which works great in the overall picture. Cosy winter time in a glass! Combine all the ingredients and let them go in an airtight container for 4-5 days. Regularly shake. After 4-5 days, strain through a cloth strainer (a sheet of muslin) and keep cool. Put all ingredients into a shaker with ice cubes and shake about 10-20 seconds (15-20 times). Strain into the chilled cocktail glass over ice cubes. This entry was tagged Aquavit, chocolade, Christmas, Clementines, thyme.